The natural pools of Semuc Champey are far more than just beautiful. They’re stunning! They’re a wonder of nature! And it’s very obvious why loads of backpackers travel all the way to the center of Guatemala to visit these beautiful pools. Aside from the pools, you can arrange some other activities in this area, like exploring the Semuc Champey caves or the K’An Ba Caves, go river tubing, or go ziplining. But many backpackers in Central America also enjoy the peace and quiet of the Guatemalan jungle, to hear nothing but the noises of nature. And you can definitely do that in Semuc Champey! When it comes to finding great accommodation, you have a few options for your stay in the area. You can either stay as close to the pools as possible: in a Semuc Champey hostel. But you can also opt to find a great hostel in Lanquin or Coban. To find out where to stay in Semuc Champey and how to find the best option for your travel style, keep reading. 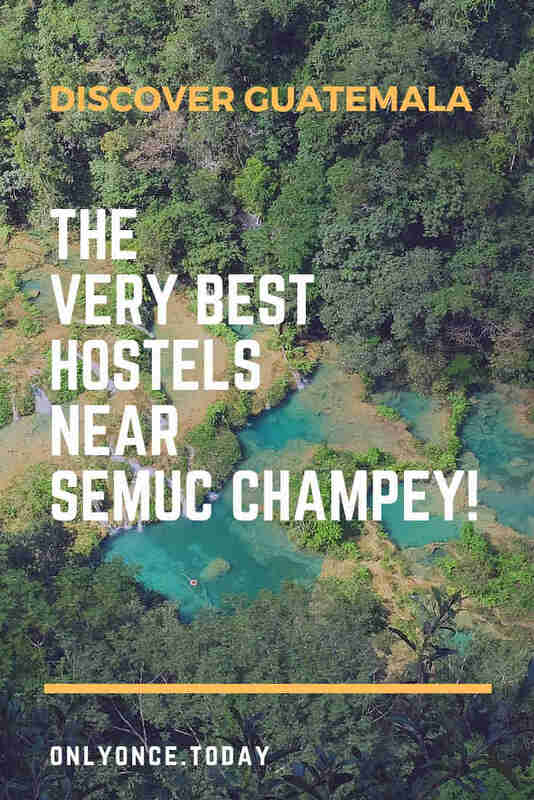 We first show you the best hostels near Semuc Champey per area and we explain the different areas at the bottom of this post. So you can also read about the areas first and then scroll back up to find the best Semuc Champey hostel. Greengos Hostel is located at a few hundred meters from the entrance of Semuc Champey. This is very close to the pools and you can walk there in 10 to 15 minutes. The hostel is a backpacker favorite! The hostel also has free purified water, which is something not all hostels provide, even though they should… There’s also an on-site bar and restaurant. Due to the location of this hostel, your only choice is to eat in the on-site restaurant, just like it is with the other jungle lodges. Note that this is not a party hostel, but also not the quietest hostel you can stay at. Music is played in the bar and gets shut off at 23h. Most guests agree that this place has a nice and sociable vibe to it. WiFi is only available during certain hours and electricity gets shut down at midnight. Make sure to arrange your free pick-up from Lanquin (if you stay at least 2 nights). At Greengos Hostel, you can book a bed in a dorm or private rooms. This hostel is not the cheapest option available, but then again, the others don’t offer the same stuff and they’re not at such a remote location! El Portal Hostal is located at the entrance of Semuc Champey, so this hostel is actually the closest you can get. The hostel is also located near the famous bridge where backpackers tend to jump off and very close to the K’An Ba Caves. This hostel is an all-time favorite among backpackers, thanks to its magnificent location. There are a bar and a restaurant on site. You kinda obliged to eat in the restaurant, since there is nothing else around. This is the same for all the jungle lodges. But you can also eat at the entrance of the National Park. Electricity is powered by a generator, which gets turned off at night. You can book a bed in a dorm room or a private room or cabin. 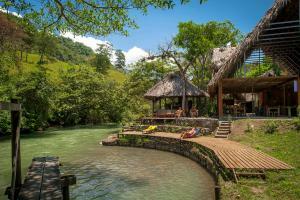 Prices in El Portal are affordable and competitive with the other lodges near Semuc Champey. 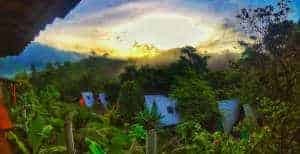 Utopia Eco Hostel is located a little over 3 km from Semuc Champey and 11 km from Lanquin, in the heart of the Guatemalan jungle. The walk from the lodge to the pools takes around 1 hour, so you can still choose to get transportation there. This place looks very slick and it has the best location ever, surrounded by nature and some of the best views in the area. The large communal deck might be the best place to stare out over the jungle. There are an on-site bar and vegetarian restaurant. You’re kinda obliged to eat in the restaurant since there’s nothing else around! Utopia Eco Hostel also offers tours and they organize activities in the hostel on a regular basis. In this lodging, you can book a bed in a dorm, as well as, private rooms, and family rooms. Utopia is very affordable and you can get a bed here for an awesome price! The Vista Verde Hostal is locally owned and ecological. Power is supplied with solar panels and you can get electricity between certain hours during the day. The same goes for hot water! If you want to absorb local culture and practice your Spanish language knowledge, this is the perfect place to do so! With a location in the village of Lanquin, next to the Cahabon River, you’re still pretty close to the National Park and the pools. The hostel arranges tours to visit the pools, but they also offer other tours. Vista Verde has a beautiful swimming pool, overlooking the surrounding nature, which is a great place to relax and enjoy the stunning scenery. There’s a great on-site restaurant and bar, which may feel expensive, since there’s not really any other place to go and have dinner. In Vista Verde, you can book dorm beds or private rooms. The cabins are basic and in touch with nature, for an afforable price. El Retiro Lodge is set in Lanquin village and it’s mainly run by locals, which is very nice. The domain is located next to the Cahabon river and it is a beautiful domain with an on-site bar and restaurant. The bar and the restaurant are directed towards the river, so you can’t hear any noise from the common areas in the actual sleeping lodges. You can engage in activities at the lodge, like ping-pong and billiard. But they also organize tours to the Semuc Champey pools, K’An Ba caves, or river tubing. In El Retiro, you can get very cheap beds in the dorm rooms, but they also have a variety in private rooms and cottages for a great price. Zephyr Lodge is an all-time traveler favorite in Lanquin. You can’t book this hostel with a booking platform, so you have to send them an email, call them or message them through Facebook to check if they have a room available. 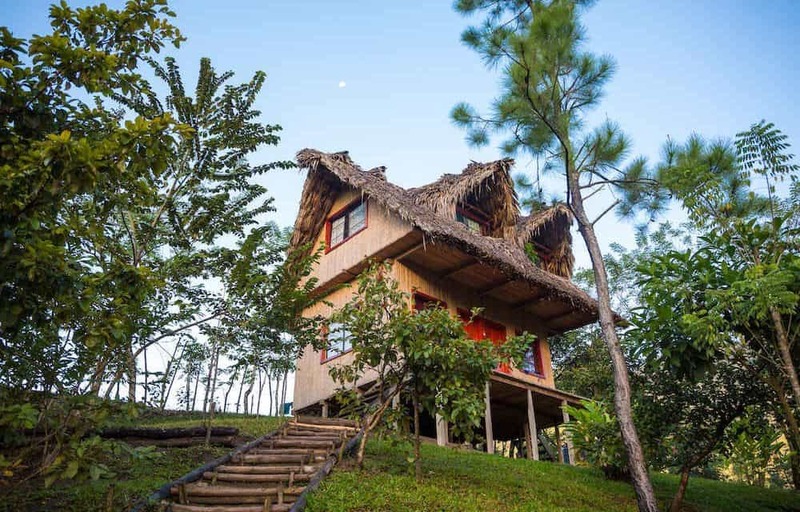 When you travel through Guatemala, you will without a doubt hear other backpackers rave about this stunning jungle lodge in Lanquin. They have an on-site restaurant and bar where meals are prepared according to your personal wishes. And also important… they have a beautiful infinity pool! In Zephyr Lodge, you can also arrange different tours and activities. You can either book a bed in a dorm or get various types of private rooms. Hostal Casatenango in Coban is a beautiful and quiet hostel. It has an awesome location, surrounded by restaurants and with a supermarket nearby. The bus terminal is a 15 min walk from this hostel. This hostel has a rooftop terrace with great views and a nice kitchen. Unlike the jungle lodges, lodging in Coban does offer the opportunity to cook your own meals. Hostal Casatenango offers dorm beds and private rooms for a great and cheap price. 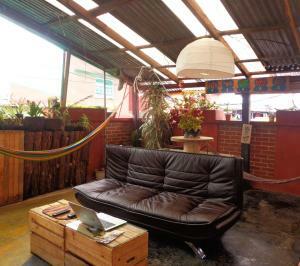 Hostal El Calvario is a nice hostel with a relaxed vibe and great service. With a location near restaurants and shops, this hostel gets tons of great reviews. You can either walk around town or get one of the free bikes they provide to go cycling. There’s a kitchen where you can cook your own meals and a rooftop sun deck. Hostal El Calvario organizes tours and on-site activities for their guests. In this hostel, you can get a dorm bed or a private room. Why Stay in A Semuc Champey Hostel? Semuc Champey Hostels are definitely the closest hostels near Semuc Champey. Most of these hostels allow you to walk to the pools without the need for transportation. If you plan on visiting the pools more than once, these hostels offer the best solution to walk to the pools on different days. These hostels also offer the experience that is the closest to nature. They’re either eco-lodges or jungle lodges. Buses don’t go here, so you should arrange a pick up in either Lanquin or Coban to reach your hostel in the first place. Staying in one of the Semuc Champey hostels is a great choice for visiting the pools. Note that if you choose this location, you will be lodged in the jungle, where some facilities might be hard to get. Electricity, Wi-Fi, phone reception, hot water, … Loads of lodges work with a generator for power supply, which they turn off at night. This is all part of the experience. These are all luxury items that can be difficult to achieve in the jungle. So if you can’t live without these, you might want to consider staying in the village of Lanquin or the city of Coban. Why Stay in a Lanquin Hostel? Lanquin is slightly further away from Semuc Champey, but still very close! The hostels and lodges in Lanquin usually offer tours to the pools, which often include the cave tour. Lanquin is a jungle town and you’re still embraced by the Guatemalan jungle. So don’t think that because you’re staying in a tiny village, that you lose all feeling with the jungle. Spending the night in Lanquin is also a great option if you want to visit the Guatemalan pools and caves. Note that Lanquin is still a jungle village where WiFi reception and phone coverage might not always be great. Loads of lodges work with a generator for power supply, which they turn off at night. This is all part of the experience. 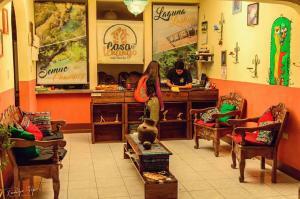 Why Stay in a Coban Hostel? 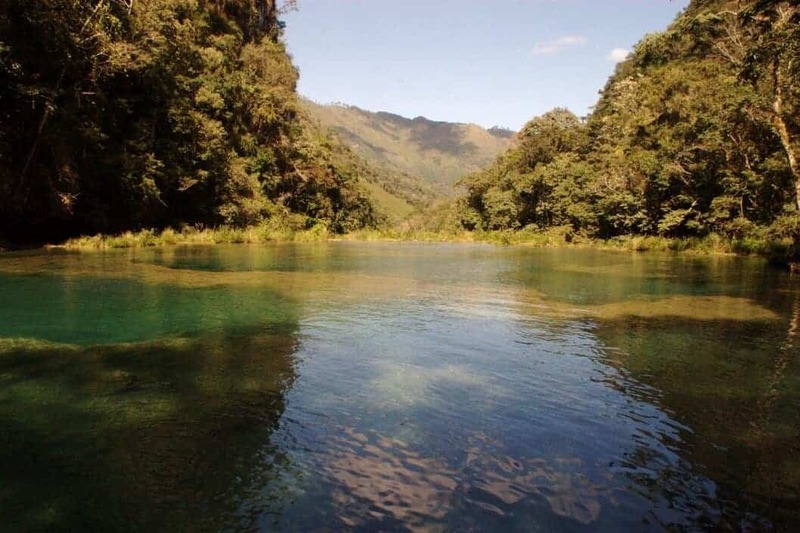 Coban is further away from the Semuc Champey pools than both of the above. You can still visit the pools in a day-trip, but most travelers don’t choose Coban for their stay. If you rather spend the night in a larger town, Coban might be perfect for you. The city has a decent bus terminal, stores, markets, and shops. So for the community feeling, Coban is great. Depending on your own Guatemala travel itinerary or your wishes, you can either stay really close to the National Park, a little further away in a backpacker have, or much further away in the city of Coban.